Since 2005, the UB Regional Institute and Southtowns Community Enhancement Coalition have been working together to advance tourism in rural Erie County, including the Towns of Brant, Eden, Evans and North Collins, and the villages of Angola, Farnham and North Collins. With grant funds secured from the New York State Quality Communities Grant Program, the institute developed a strategic plan for tourism development in October 2007, with recommendations for building agricultural, heritage and recreational tourism, as well as addressing visitor supports such as marketing, wayfinding and visitor readiness. The strategic plan was based on a tourism asset inventory, completed in December 2005. A preliminary assessment of the area’s tourism opportunities was produced in June 2006. 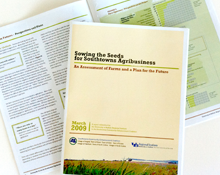 Building on the tourism strategy, and initiating the first step of a major agribusiness development effort, the Coalition and institute partnered in fall 2008 on a survey of farms in the Southtowns. The effort – “Sowing the Seeds for Southtowns Agribusiness” – assessed current agritourism offerings in the area, farm operator interest in expanding visitor services and farm tourism capacity. The final report offers recommendations for advancing the market, including developing a Southtowns farm trail, leveraging the “buy local” movement and developing farm-based recreation. Findings were presented to the community in March 2009. The next phase of the effort linked farms to the tools they need to develop agritourism businesses, including marketing and business planning assistance and funding resources.